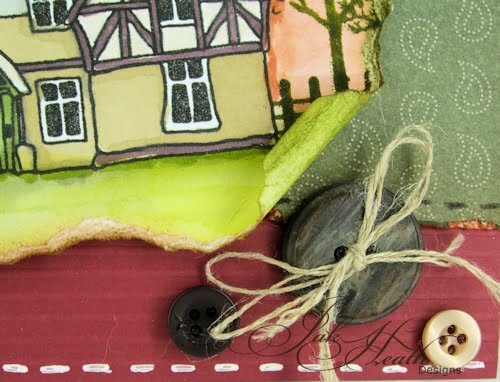 A country card made with the Clarity Cottage & Waymarker Set stamps quite a homespun feeling to this card, stamped and coloured with Promarkers and watercolours, Stampin Up papers, ribbon, buttons, twine, spiral punch and a bit of love to bring it all together. 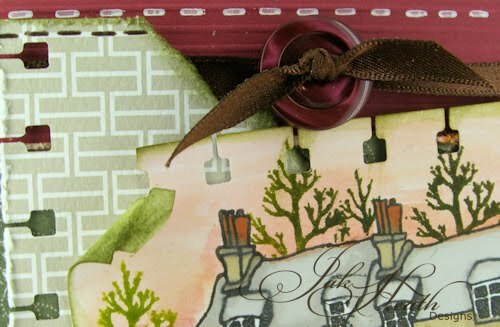 Notebook edging made with the Stampin Up Spiral Punch and some faux stitching. A rolled up distressed corner and a few buttons to make the card pop. What a unique, fun card from a company I'd never heard of before. Awesome card!!! Great card Jak so different. very different and gorgeous card i LOVE it! Absolutely stunning Jak, i just love the colours. Wonderful jak....oh and I do wish I was as supple as your adorable grandson! 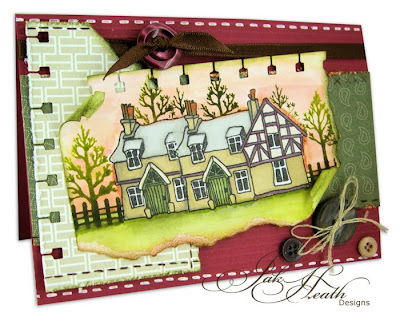 Another lovely card, where do you get your ideas from, I would never think of designs like that. wonderful. wow another gorgeous card Jak, i don't know how you think up new ideas day after day. I found your blog on the Clips-N-Cuts blog hop when I was poking about. I love your attention to detail. Fabulous card! Stunning card - beautiful scene setting. Beautiful card Jak, The colouring is so lovely.